Our goal is to develop well rounded young men and women who learn not only the fundamentals of football, but also the importance of education, in an atmosphere favorable to developing sound mind, body and character - and having a good time along the way. We practice the ideals of sportsmanship, scholarship and physical fitness. Our program stresses learning lessons such as, self-discipline, teamwork, concentration, friendship, leadership, and good sportsmanship. We will do our very best to ensure that each player is utilized to his utmost potential and their talents are used for the teams best advantage. The team comes before the individual. 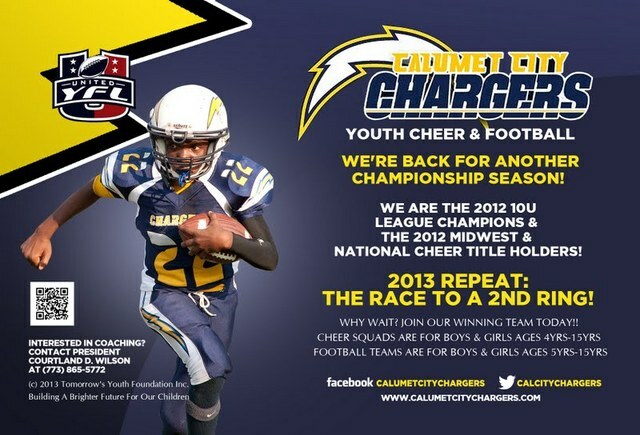 The Chargers program is a founding member of the Chicago Southtown United Youth Football League. Our national youth cheer & football program is also a proud developmental partner of USA Football​​ and a community partner of the Israel Idonije Foundation. Stars & Strikes, is a United States Bowling Congress Youth Program (USBC Youth) that focuses on providing a safe environment for learning fundamental bowling skills. We strive to promote good sportsmanship, teach proper bowling etiquette, and we utilize positive reinforcements at all times. Our program offers many opportunities for young people to learn a sport they can enjoy for a lifetime, improve their physical skills, develop teamwork, and leadership abilities. We are placing the FUN in fundamentals. Bowling should always be fun! !